Audio T Southampton's (well John's) Top Ten Home Cinema Demo Movie Scenes! 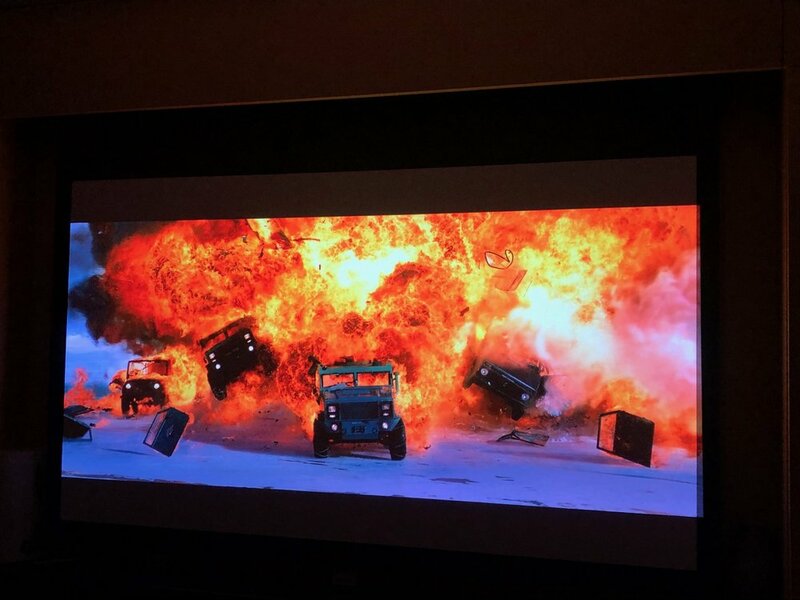 Our resident Home Cinema fan John has some personal favourite movie scenes which he uses to set up and calibrate AV systems. We thought we would share a few with you in case you want to put your own Home Cinema through it’s paces. Straight in at No.10 is Battleship, scene 15 running into 16. I would just like to make it clear at this point that artistic quality is not a factor here. This is just a dynamic visual and audio extravaganza which tests dialogue coherence (but sadly doesn’t improve content!) during action sequences. No.9 is another movie which majors on automotive action rather than subtle characterisation… Fast and Furious 8 (is that all..? ), scene 17, will give your system a thorough work out, although the language is a bit fruity. No.8. Iron Man 2, scene 16. Not an Art House film, although there’s a bit more acting and dialogue here, but being John’s choice, it is mainly gunfire and explosions… again. Good surround effects though, from the laser sequence. No.7. X Men Apocalypse, scene 14. I think you get the picture, as it were, by now. Not exactly cinema verite, but this scene includes some clever slow motion CGI and very effective Dolby Atmos accompanied by the Eurythmics backtrack. No.6. Terminator 2, Judgement Day., scene 4. A bit of a classic now, albeit not in the same sense as Citizen Kane, for example, but these are John’s selections…This is a well filmed vehicle chase sequence with an excellent soundtrack. The Harley sounds convincingly throaty on a good, well set-up system. No.5. Top Gun, scene 1. Stepping even further into the past, John has gone with the opening scene with it’s full throttle soundtrack providing a test for anyone brave enough to turn the volume up to 11. WARNING! John has damaged speakers doing this so please do exercise some caution. Top Gun top tip is to play the DTS soundtrack to avoid audio disappointment. No.4. Back to the Future III, scene 15, the duel. Guns again… However, central to John’s selection this time, is the atmospheric sound and musical soundtrack during the gunfight. It’s a fair cop. And at No.1. Bohemian Rhapsody, scene 23. A masterful recreation of Queen’s 1985 performance at Live Aid. John would have loved to have been there, if only he wasn’t five, but this movie gives him more than a taste of the real experience with Dolby Atmos providing the requisite acoustics in order to suspend disbelief. 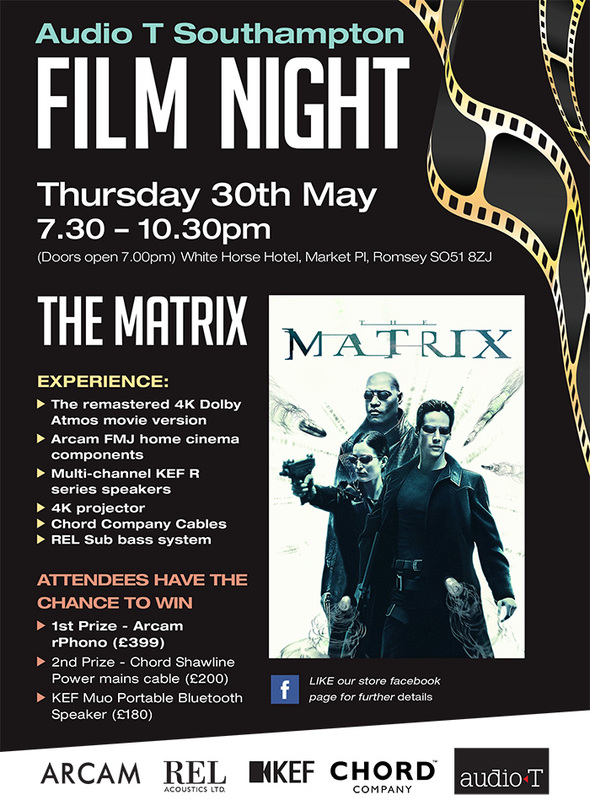 We will be hosting a Movie Night at The White Horse Hotel Romsey on 30th May. The movie being screened is yet to be selected but please rest assured that John won’t make the final decision without supervision. Perhaps you would like to email us with some suggestions?! Don’t forget to check out our store blog for Movie Night updates closer to the date. Audio T Cardiff's New 'Walk-in' Home Cinema! A home cinema or theatre setup, is something that many people don’t have much experience of, but done well it can further enhance your enjoyment of TV and films. We love introducing people to home cinema sound and have decided to put together a ‘walk in’ home cinema on the shop floor, which can be experienced by anyone without the need to book an appointment! In this month’s blog we will take you through the home cinema system we have put together and how it could be a perfect addition to your film and TV programme watching pleasure. 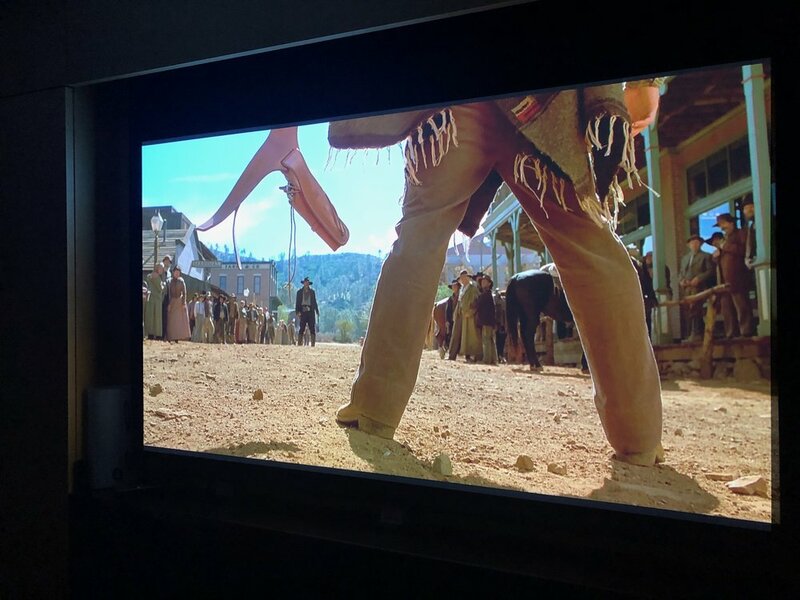 We start off our home cinema experience by looking at Panasonic's brand new 55” OLED 4k television, the catchily named TX55FZ802. This is the best TV screen Panasonic have made and is one of the most affordable OLED screens on the market. Anyone yearning for the old days of plasma need look no further as OLED is finally delivering on its promise with Panasonic really at the forefront of this new technology. Panasonic consulted experts in Hollywood while the set was in development to make sure the result was as close to the vision directors have of their films as possible and you can tell! The colours are rich, detailed and realistic with some of the most incredible blacks we have ever seen. This is because of the new Studio colour HCX2 processor which Panasonic describes as ‘the pinnacle image processing expertise’, tuned to show off the best quality colours, blacks and brightness. The set has multiple high dynamic range (HDR) support - HDR has been developed to offer greater picture quality by allowing more contrast - and has no problem with the various standards that are around at the moment. It is a smart TV as is standard these days, so comes with all the online services such as Netflix, BBC iPlayer, YouTube and many more. Finally the build quality and design of this set is exceptional, the incredibly thin screen takes up the whole of the set with very little bezel either side. This TV really does give you an experience you really don’t want to miss out on. Connected to the Panasonic via HDMI we have the new Denon AVR-X2500H AV receiver as the central hub of our setup. We were huge fans of its predecessor the X2400H and Denon have made it ever better! This new offering retains the myriad of connections and features of the model before it while adding even more. 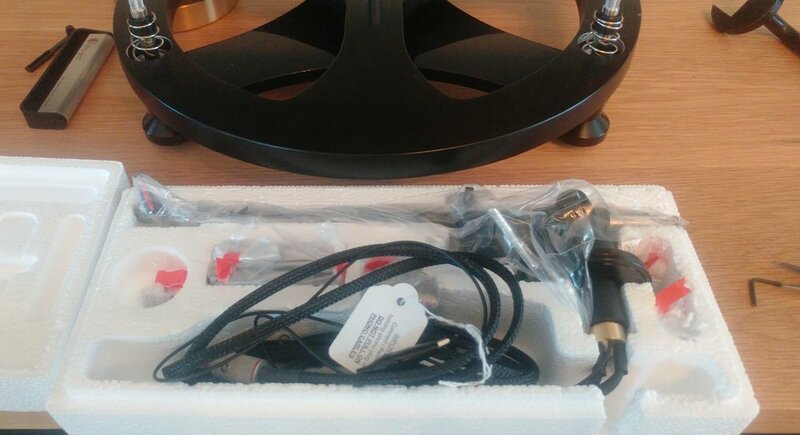 On the front panel you have your volume and input selector knobs alongside buttons for basic functionality as well as a headphone output, input for the setup microphone and handy HDMI input. The back presents you with a huge amount of options including eight HDCP 2.2 equipped HDMI inputs, optical and coaxial digital inputs and your old school analogue inputs. The x2500 is marketed as a 7.2 channel receiver and while this is accurate it hides the amount of options that this gives you, after your front speakers are sorted you have two extra pairs to have as either rears, sides or both. You could have a pair of height speakers for Dolby Atmos or assign a pair to zone two to use as a stereo pair in another room; this versatility is exactly what you want in an AV receiver. The amp is capable of powering a large range of speakers so you can really customise your setup to the way you want it. There aren’t many formats that the Denon will struggle with, as we mentioned it can handle Dolby Atmos but also DTS:X and DTS Virtual:X when it comes to audio as well as Dolby Vision, HDR, HLG and naturally 4k up scaling. The Denon has multiple ways of streaming audio; it has Bluetooth and WIFI streaming for services such as Spotify, Tidal and Amazon music. As it is part of Denon’s HEOS range you can also multi-room it to other HEOS devices such as stereo amps or powered speakers to have both your TV sound and music in different rooms in your house simultaneously. The build quality seems to be even better than Denon's already high standards, it seems more robust and solid somehow, an all round excellent AV receiver for the money. The AVR x2500 is capable of powering a huge variety of speaker setups and of course as it is running on our shop floor we can easily and quickly swap speakers out if any of our customers wish to hear something specific, however on a day to day basis the speakers we have chosen to have running in our little cinema are Dali’s Zensor range. Specifically Zensor 7 floorstanders at the front either side of the Zensor Vokal centre speaker, the stand mount Zensor 1’s at the rear and the E-12 F subwoofer with its 12” driver. This setup can be purchased as a package which is why we chose although you could easily swap out any of the pairs of speakers for the larger Stand mount Zensor 3 or the smaller floor standing Zensor 5. We have reviewed the Zensor series before on this blog so we won’t go into too much detail here except to say that the whole Dali Zensor range is absurdly good value for money and provides you a fantastically fun listening experience for both movies and music. The important question of course is what is the result of all of this equipment put together? We have been using Oppo’s excellent UDP-203 4K player as a source to watch and listen to a huge variety of films and music and nothing has failed to impress. One of the greatest joys of a surround sound setup is watching well mixed concerts and one of the best is Hanz Zimmer’s recent ‘Live in Prague’. Featuring one of the most talented set of musicians you will ever see, the system takes you right into the music as if you were sitting on the concert hall yourself. It is an unforgettable experience and everyone should have the chance to hear the theme from the movie ‘Gladiator’ in a 5.1 setup, the word epic doesn’t do it justice. Another must when it comes to music is to experience Pink Floyd’s ‘Dark Side of the Moon’ in surround sound, the intro to ‘Time’ being a particular highlight. The system takes you right into the action when it comes to movies with dialogue being crisp and clear, action scenes being huge and involving and movies that are particularly well mixed for surround sound such as the Morten Tyldum directed ‘Passengers’ use the medium to their advantage so much so that you will think you are in outer space! Our party piece for showing off how good the Panasonic television is has got to be the BBC’s ‘Planet Earth’ which is simply breathtaking in its vivid colours and detail and shows you everything that OLED technology has got to offer. There nothing like experiencing a system like this in person and we have it running continually while the shop is open, all you need to do is pop in, no appointment necessary, have a seat on our comfy sofa and see what all the fuss is about. We look forward to seeing you! Panasonic and Denon products can be ordered at all branches of Audio T.